Wrexham manager Kevin Wilkin has released striker Rob Ogleby - bringing to six the number of players not offered new contracts by the club. Ogleby joins Dave Artell, Joe Anyinsah, Stephen Wright, Kyle Parle and Jay Colbeck who had already been released. The 22-year-old scored six goals in 33 appearances for the Dragons in the 2013-14 season. 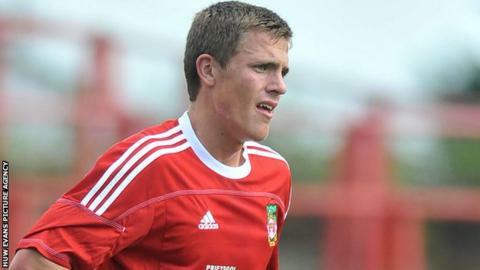 Wrexham were 17th in the Conference Premier, their lowest finish since dropping from League Two in 2008. Captain Dean Keates has been offered a new contract, along with Theo Bailey-Jones while Anthony Stephens has verbally agreed a contract. Other players given new deals are Johnny Hunt, Mark Carrington, Danny Livesey, Andy Coughlin, Nick Rushton and Jonathan Royle. Ogleby - a former Wales Under-21 international - was signed by former Wrexham manager Andy Morrell on a free transfer from Hearts in January 2012. "We wish him well and he will find a new club no problems," manager Kevin Wilkin told the club's website. "He's a smashing lad, and I hope he goes on and continues his career successfully elsewhere." Wilkin still has to speak with goalkeeper Joslain Mayebi and discussions with midfielder Joe Clarke will be ongoing over the next week or two. Former Liverpool player Wright, 34, will also return for pre-season training in a bid to prove he deserves a new deal.